The beauty of summer is all around the valley, especially in the numerous summer gardens that several valley residents prepare for the annual Hailey Garden Tour. The tour is presented by The Friends to benefit Hailey Public Library. The tour will take place on Saturday, July 23, from 10 a.m. to 2 p.m. Tour tickets are $20, and raffle tickets for a Garden Cruiser bicycle donated by Sun Summit South are $5 available at garden centers, the Hailey Library or on the tour. For details, e-mail haileylibraryfriends@gmail.com. This year's tour, "From the Wonders of Woodside to the Fecundity of Foxmoor," features 11 exquisite gardens, all different from one another. 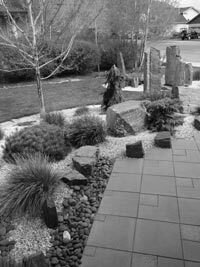 The gardens feature a variety of stone used in many different applications as well as vegetables, fruit trees and flowers—wild and tame. The gardens vary from the personal yards of two professional landscapers to a brand new city park made with recycled materials and native plants. The tour includes gardens with water features, terraces, patios and paths, which were all created by hand. The tour also features one of the oldest still-productive farmsteads in town and a LEED for Neighborhoods pilot project that protects and enhances the environment and quality of life. In addition to the beautiful gardens, the tour will include entertainment, information and advice from experts. Touring with bikes is recommended but leave dogs at home.